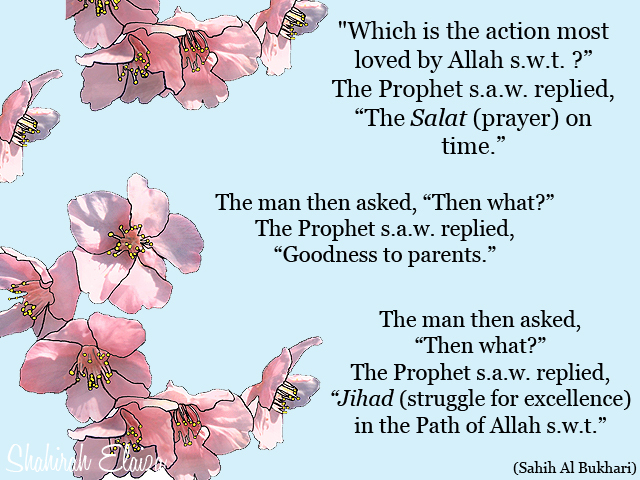 Actions Loved by Allah s.w.t. A little boost for those who are struggling with their prayers. Set realistic goals for yourself everyday. Two words: baby steps. A reminder to those fortunate enough to still have their parents. Parents aren't perfect but that doesn't mean they don't love you. Be kind. Show them some love and appreciation. Today could be your last day with them. You never know. A motivation for everyone who is struggling with something difficult. Every great and meaningful accomplishment is the result of dedication and hard work. what a beautiful post!Thank you.I'll definitely will print it out and stick it on a wall. May I,please :)? In my opinion one of the most beautiful things that Islam teaches is the respect and love for parents.It's not always easy (let's be honest),but as you said we never know how long they're going to be here. I love how understanding and aware you are of other people's different levels of spirituality, if that makes any sense to you. You're very humble about your own connection with God. This is such a beautiful reminder,Shahirah.